Hotel Ambady is a best hotel in Kerala at Idukki District which has complete facilities and good infrastructure. They provides good customer services as well as quality. Do you want to know more about Hotel Ambady. Read here about facilities, tariff plans and contact address of Hotel Ambady. The Hotel Ambady is a high quality Hotel in Kerala. It has 46 room theme resort which is situated at Periyar and it is one of the first private sector resorts in Kerala. 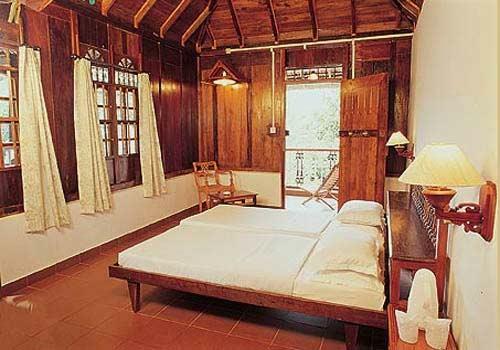 Hotel Ambady is designed by the renowned Architect Mr. Laurie Baker the hotel was conceptualized on the traditional architectural splendor of a typical Kerala village with a Tulasi Thara and Nellukattu. Ambadi is the name denotes the birth Place of lord Krishna. The Hotel Ambady good with a spacious rooms which is simply clean and good in heritage also with some modern facilities with air conditioned and also available in Non – Air conditioned rooms. The room has an antique object a huge metal safe in one room, an ornate set of trinket boxes are tells about our heritage. The stroll round the hall tends us to be in museum and it will be mostly like those who prefer for heritage. The Hotel Ambady is mostly liked by many peoples and it is fully furnished with great values. The Interior and exterior are good enough. Here in Hotel Ambady we can have an Ayurveda therapy in lake view Dining room for families who can chat over there and enjoy for whole night. The Hotel Ambady is mostly liked by Honeymooners. Car Hiring is also available for guest to visit some tourist spots around the Hotel Ambady Doctor-on-call facility also available for guests. Here everything is in traditional and village style that admires most of the guests to drive in for Hotel Ambady. Traditionally hand crafted cots, tables, chairs are preserved with passion. Another thing is the stone floored dining room. •	Check In: 12:00 Hrs. The Hotel Ambady is got with its natural beauty over the lake and the views are fascinating for everyone who wants to admire Kerala. Here Many facilities are available for guests with moderate cost and guest can experience a pleasure full atmosphere overall in the Hotel Ambady. Overall the views captured here are most memorable and can able to hide it from others. Many tourist spots and The Hotel Ambady is also loved by Honeymooners. And people will surely like this place if they visit. The atmosphere overall tends every people to come again and again without fail and they are not able to leave the place that much easily. Here there is a Boating in the Famous Periyar Lake is very enjoyable and you will spot wildlife sanctuaries on either side as you cruise along. Ammatchy Kottaram is an ancient summer palace built by the Maharaja of Travancore in traditional Nallukettu Style. The Exotic Mangaladevi temple and The Pallikannu which is the 18th century British church is also located very nearer to the Hotel Ambady. These are some of the sightseeing areas in and around Hotel Ambady.